Grew up… with his grandmother after his father died. To this day, despite his aggressive tendencies, Happy always shows love, kindness, and loyalty to his sweet grandma. Living… in his hometown of Waterbury, Connecticut. Happy is known around the neighborhood for his belligerent attitude and foul mouth. Profession… golfer. Happy discovers one day that he has an unusual talent for the game of golf. As a result, he’s taken up a lucrative career as a professional golfer, though the churlish Happy is having some trouble abiding by the gentlemanly conduct traditionally expected in the game. Challenge… winning enough money playing golf to help his grandmother take back her house. Happy’s grandma, it turns out, hasn’t paid her taxes in decades. Now the IRS has re-possessed her house until she can pay back the $275,000 that she owes the government. 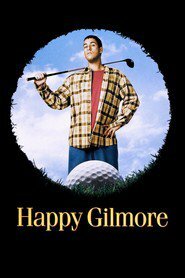 Happy Gilmore's popularity ranking on CharacTour is #2089 out of 5,000+ characters. See our top-ranked characters and read their profiles.